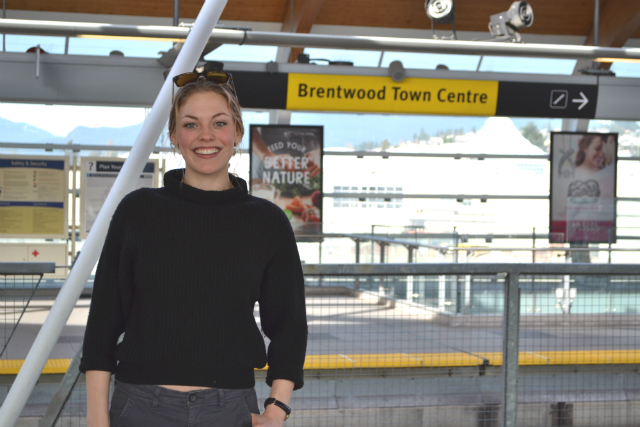 I met Levi on a lovely afternoon at Brentwood Town Centre Station in Burnaby. I must admit, this was not a typical stop for me as I usually use the Expo Line and the other side of the Millennium Line, but I love exploring the transit network and meeting riders where they use the system! Levi is just 18 and uses transit daily to commute from her home on the North Shore to her job downtown and to school at BCIT. She says transit does more than just gets her where she needs to go, it creates a community of those who use it and connects our region in a way nothing else can. Levi has lots to say about transit, so let’s get to it! What does transit mean for someone growing up in this region? When I was in grade five, one of my best friends had so much independence and I had very protective parents and if I wanted to go anywhere, I was given a ride. Sometimes I didn’t want a ride, I wanted to take the bus! That never happened. Somehow, the bus turned into the symbol of independence for me that represented true mobility and maturity. It may sound funny but it really was for me! When was the first time you took transit? I think the first time I got to take the bus all by myself was finally in grade eight and I was so scared! I remember a million things going through my mind: What if I got on the wrong bus? What if I pulled the cord at the wrong time? What if it doesn’t stop when I need to get off? It turned out absolutely fine and from then on, it was my favourite way to get around. Why do you take transit now, as an adult? Honestly, parking is super expensive at school and I have a UPass! It would just be so silly of me not to use it. I live just on the other side of the water so it doesn’t take me very long to get to school. It seemed redundant to me to live so close to transit and pay for another mode of transportation including gas, insurance, parking and deal with traffic just for a tiny bit more convenience. Plus, I would only drive myself, I don’t have anyone to carpool with so that would be pretty wasteful and expensive. What is your favourite mode of transit? Out of all the modes, I would say SeaBus. Mainly because I think there’s an operator or captain person. I like the idea of seeing the person driving my vehicle — the SkyTrain is super fast and awesome but no driver kinda creeps me out. I know that’s strange, call me old fashioned! Plus, it’s the only transit that you can never miss your stop! When I worked downtown on the later shifts, it was great because I could have 15 minute power naps without worrying about not getting off at the right place! Do you have any fun or sweet stories about transit? One day when I was first commuting to and from BCIT, I was on my way home and the buses were very busy. It was looking like the bus was full so I would have to wait another 30 minutes for the next one. Then a driver came along and asked if anyone, who wasn’t going to the final destination in North Vancouver, could wait for another bus just behind. A bunch of people were kind enough to get off and get the other bus meaning I could get on and go home after a long day. It was great on two levels; one, the operator taking control of a situation to be more efficient and just help out and two, the other passengers who did get up and change buses to help some other people out. Now, THAT bus driver is my favourite in general because he always talks to the riders. He has a series of jokes he goes through and he always says the connecting buses at major intersections so people know. He just goes above and beyond all the time! If you had a transit wish, what would it be? I bet everyone says they want more buses on their route or in their neighbourhood, right? Well, I’m no different! Ha ha! I actually completely understand why my bus route doesn’t have a lot of frequency. I know there aren’t a lot of people that take it and it wouldn’t make a ton of sense but I can still wish for more! Thank you for the tea and the transit talk, Levi! It’s great to learn more about our riders’ experiences on the system. Do YOU want to be featured in a Talking Transit interview here on the Buzzer blog? Talking Transit: Tell your transit story!